“The Groton” is an 1835 square foot home Transformations, Inc. built and sold in the Coppersmith Way development in Townsend, MA. It was started in late 2009 and completed in June of 2010. This home is a second generation Farmhouse model with a garage under to fit the sloped site. Many of the energy efficiency features have been honed in on though cost effective evaluations and input from many in the building science field. The shell and energy efficient features of this home are highly repeatable. Transformations currently over 100 homes in the development and building pipeline with similar zero-energy specifications. 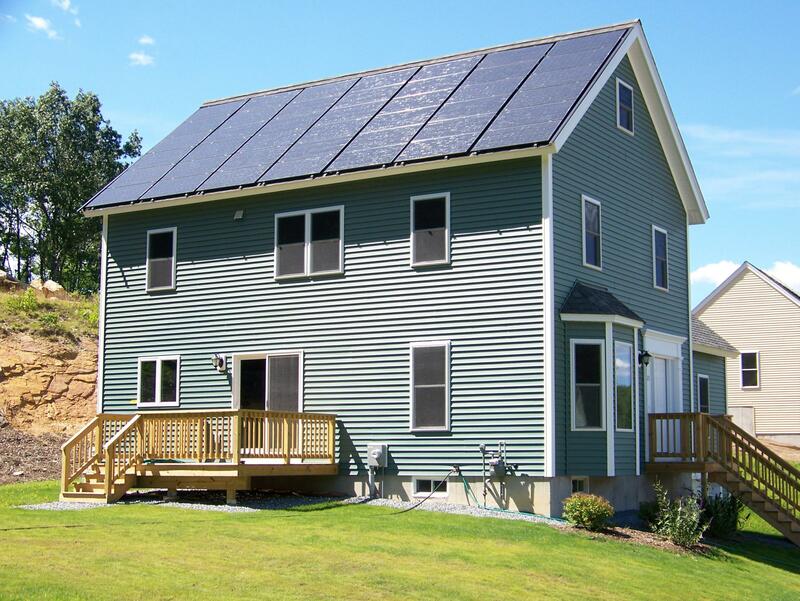 The cost to get to zero energy has been brought down to $3 per square foot over a stretch code home with a leased PV system. 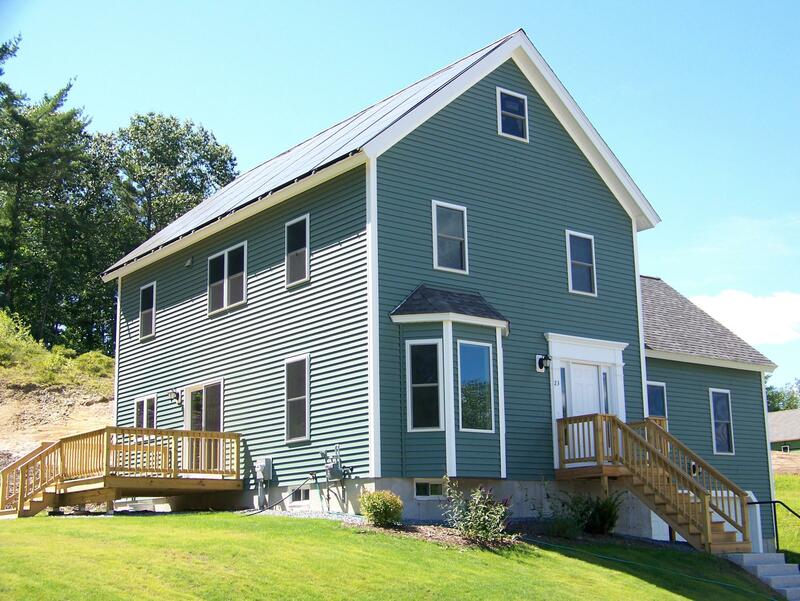 At these prices, the zero energy homes can spread fast throughout Massachusetts and other states with Solar Renewable Energy Credits. It is Transformations goal to help speed this process. The typical home saves about 60% of its energy in the shell, appliances, lighting, hot water, etc. The other 40% or more is made up though the PV. 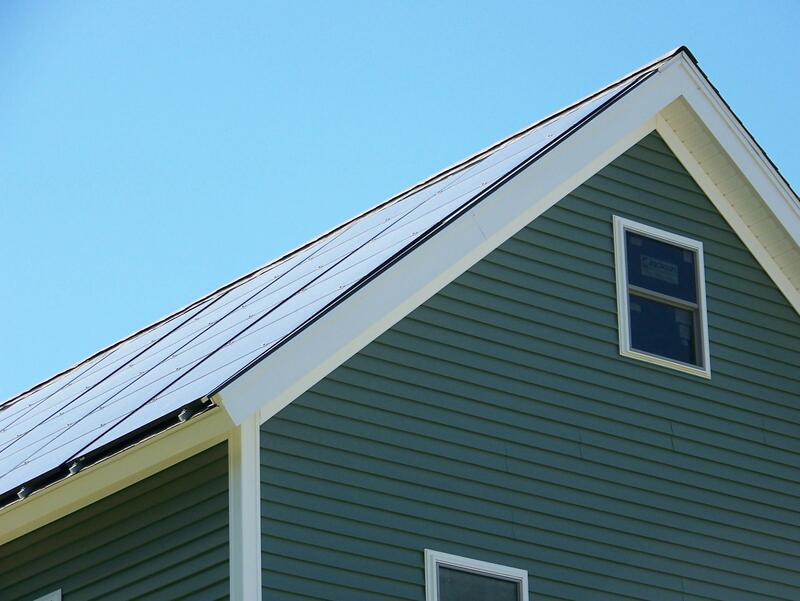 The Groton features a 7.14 kW PV system that is integrated into the surface plane of the roof for a pleasing aesthetic. We attained the look of BIPV without the cost! The roof under the PV system was recessed 8” inches to accomplish this. Black framed mono-crystalline panels further this curb appeal. A Navien 180 instantaneous gas fired hot water heater was used in place of any solar thermal systems. It did not take up any roof space, cost $1,800 to install (as opposed to $8,500 for a solar thermal system) and used only about $43 worth gas over a 12 month period (36 Therms). The ventilation system used was a Fantech 1504 Heat Recovery Ventilator. We exhausted the three bathrooms and supplied fresh air to the hallway on the second floor. This was done at less than half the price of the LifeBreath systems we used previously. 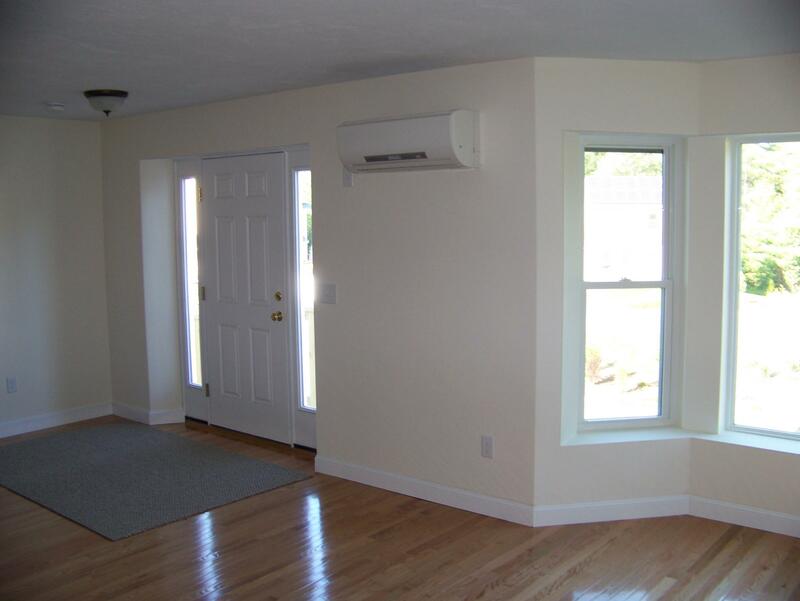 This “Groton” model home was cost effective to build, has excellent curb appeal and is vastly repeatable and scalable. It was built on speculation and sold for $359,900. The positive energy produced was about 1450 kW hours a year. This is enough energy to supply a plug in Prius a modest commute, 5 days a week, 50 weeks a year. With homes like these, we can solve the carbon emissions of the building sector and start to work on the transportation sector as well! Area of conditioned space is measured from the exterior. Renewable Energy System Description & Details: Utility only provides net usage. See utility bills for supporting data. (42) Suntech 170 watt mono-crystalline panels in black frames; (1) Solectria PVI 3000 inverter and (1) Solectria PVI 4000 inverter Peak power rating is 7.14 kW Projected annual production is ~8,000 kilowatts per year.